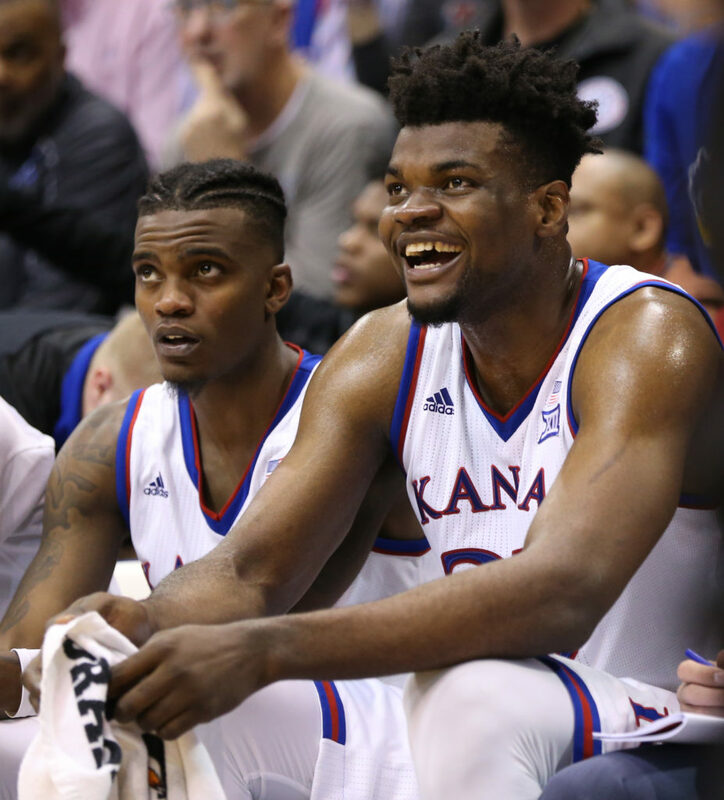 Kansas center Udoka Azubuike, right, has a laugh with Kansas guard Lagerald Vick during the second half, Saturday, Jan. 27, 2018 at Allen Fieldhouse. The news came out slowly and from a variety of places a little before 12:30 p.m., central time, on Wednesday afternoon. 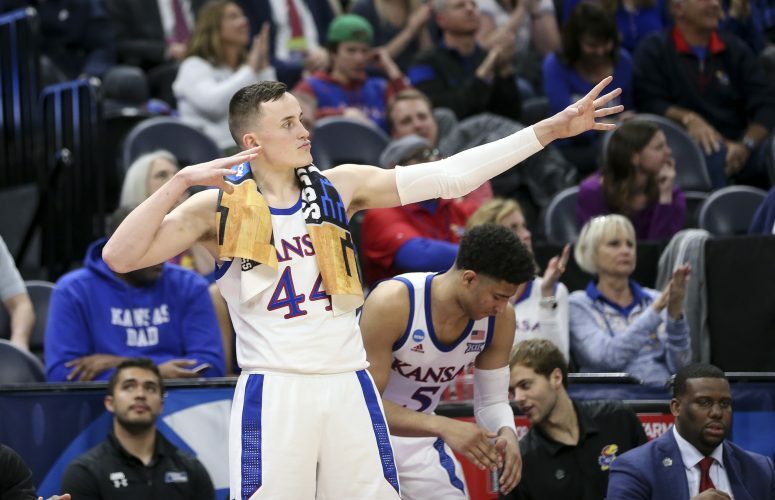 So, officially, it will go down as KU big man Udoka Azubuike making a decision to return to Kansas with 11 hours to spare instead of at the 11th hour like his former teammate Svi Mykhailiuk a year ago. But regardless of the timing or the circumstances surrounding each, in the end the decisions were the same — Azubuike, like Svi, wanted one more year at Kansas. About 20 minutes after KU coach Bill Self confirmed to the Journal-World that Azubuike would return for the 2018-19 season, KU officials sent out a news release that included a few thoughts from Azubuike. 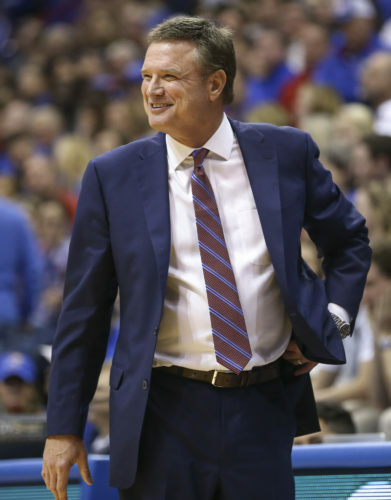 In it, he explained what went down during the past month and sounded like a young man eager and excited to make another go of it with the Jayhawks. As of Tuesday night, Self still was not fully aware of what Azubuike’s decision would be. 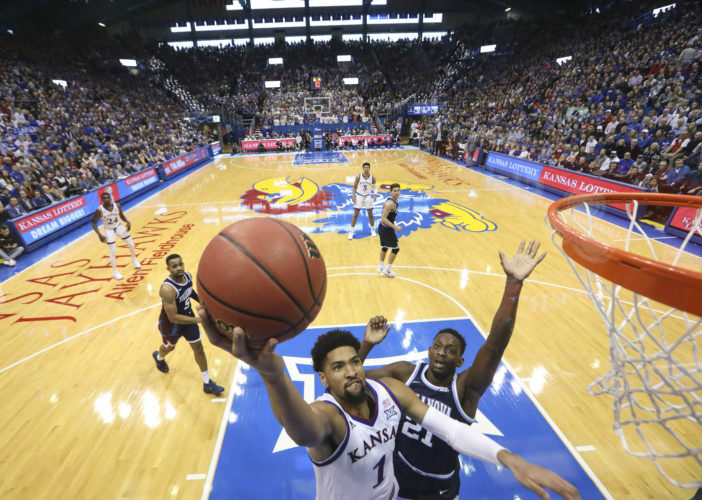 But the Kansas coach who is set to enter his 16th season with the program — and now has to be looking forward to it a lot more than he would be had Azubuike decided differently — said he never had any issue with the 7-foot center taking his time with the decision. Asked then what he was hearing from the NBA evaluators who spent time in the past few weeks looking into Azubuike’s draft status, Self painted the picture of a player who had more than a few admirers. Clearly, those goals and that information were not provided and now Azubuike can flip the switch fully to focusing on his third season with the Jayhawks, which officially gets under way next week when the KU players report to campus for summer school and the start of summer workouts. One of the biggest things Azubuike likely will hope to get out of his junior season involves his health. After playing in just 11 games as a true freshman before a wrist injury sidelined him the rest of the way, Azubuike suffered a Grade 1 MCL sprain in his left knee in early March, which caused him to miss KU’s three games in the Big 12 tournament and play at less than 100 percent in KU’s five NCAA Tournament games. Seeing what he can do with a full season, along with the feedback he received from the NBA folks during the past month, would surely increase Azubuike’s chances of entering the draft in 2019. Azubuike started 34 games for KU in 2017-18, averaging 13 points and seven rebounds per game. His 77 percent field goal shooting led the nation and set a Big 12 single-season record. He also ranked eighth in the conference with six double-doubles and his 1.7 blocks per game were sixth in the Big 12. He was an All-Big 12 third team selection following the season and also earned a spot on the Academic All-Big 12 second team. Azubuike has played in 47 games for Kansas, with 40 starts and an 11.1 points-per-game average. He has scored 20 or more points in seven of those 47 games, with each coming during his sophomore season. The KU center from Nigeria takes career highs of 26 points (vs. Nebraska, Dec. 16, 2017) and 13 rebounds (at Texas, Dec. 29, 2017) into the rest of his KU career.